Ann-Delia Bayer, a longtime volunteer with the HPS Network, passed away on Dec. 9th, 2017. She is survived by her husband Robert Bayer and her daughters Katrina and Sarah as well as her brother Timothy (Stacie) Valentine and his children Corrine and Jena. Bayer was actively involved in HPS Network events, even though no one in her family was affected by the syndrome. For a decade she managed the kids’ dance party on Friday night at the HPS Network conference. The party gives kids affected by Hermansky-Pudlak Syndrome, their siblings and the kids of adults with HPS, a chance to have fun together and get to know one another. 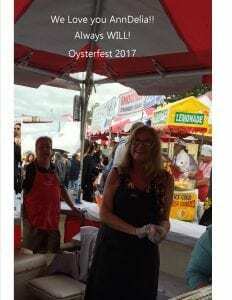 Bayer also regularly volunteered at the HPS Network booth at the Oyster Festival, held annually in Oyster Bay, N.Y. and at the HPS Network annual Christmas Concert. Bayer knew the Appell family through their church and started her volunteering with the HPS Network when she heard about the Network’s need for volunteers to help with the annual conference. Her family has asked that in lieu of flowers, donations be made in her memory to the HPS Network.